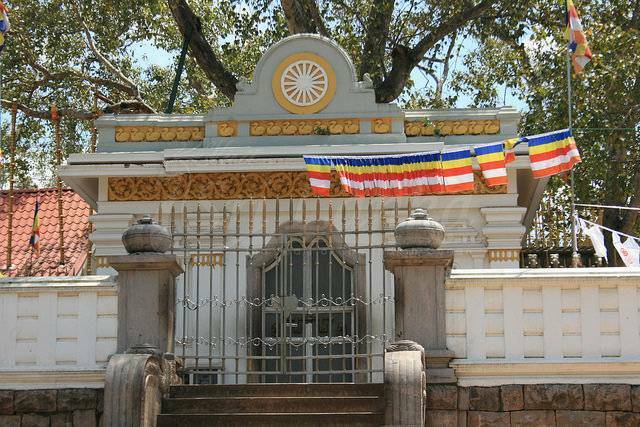 Jaya Sri Maha Bodhi temple is the centre of tourist attraction in Anuradhapura. Buddhists from all over the world visit this place because it enshrines the great souvenir of the past and pride of the present, The Bodhi tree. This 2000 year old Bodhi tree is the oldest living tree in the world with historical records. This is the parent-tree of all the revered 32 Bodhi trees which are grown from its saplings. This tree has deep connections with Buddhism and Lord Buddha. This tree is grown from the cutting brought from the original Bodhi tree under which Buddha attained Enlightenment. After Milinda, it was Sangamitta Theri, daughter of Asoka, who carried this responsibility of spreading the religion and the saplings were planted by king Devanampiyatissa in 249 BC. As the original tree at Bodhgaya in India was destroyed, this Bodhi tree in Sri Lanka has been given utmost respect and importance today. There are many Bodhi trees here in this temple but the one on an elevated platform is the oldest and venerated. People throng to this temple on full moon days to immerse in the spirituality and divineness present in the air.